PARIS (AFP) ― The space rock that smashed into Earth 65 million years ago, famously wiping out the dinosaurs, unleashed acid rain that turned the ocean surface into a witches’ brew, researchers said Sunday. Delving into the riddle of Earth’s last mass extinction, Japanese scientists said the impact instantly vaporized sulphur-rich rock, creating a vast cloud of sulphur trioxide gas. This mixed with water vapor to create sulphuric acid rain, which would have fallen to the planet’s surface within days, acidifying the surface levels of the ocean and killing life therein. “Concentrated sulphuric acid rains and intense ocean acidification by impact vapors resulted in severe damage to the global ecosystem and were probably responsible for the extinction of many species,” the study said. It occurred when an object, believed to be an asteroid some 10 kilometers wide, whacked into the Yucatan Peninsula in modern-day Mexico. 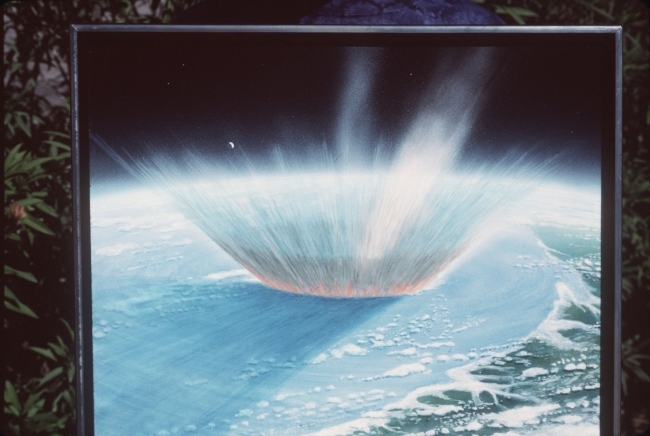 It left a crater 180 kilometers wide, ignited a firestorm and kicked up a storm of dust that was driven around the world on high winds, according to the mainstream scenario. A common theory is that a “nuclear winter” occurred ― the dust pall prevented sunlight reaching the surface, causing vegetation to shrivel and die, and dooming the species that depended on them. Another fiercely debated idea adds acid rain to the mix. Critics say the collision was far likelier to have released sulphur dioxide. And, they argue, it would have lingered in the stratosphere rather than fallen back to Earth. Seeking answers, a team led by Sohsuke Ohno of the Planetary Exploration Research Center in Chiba set up a special lab rig to replicate ― on a tiny scale ― what happened that fateful day.